Tele-monitoring of frail people can provide a system of tele-monitoring/tele-assistance to people identified by social services as at risk, typically elderly, who live alone or are able to live independently but with a condition that might require a level of monitoring to ensure rapid and effective intervention in emergency situations and improve real and perceived safety. The solution has been implemented as a watch able to provide automatic readings of skin temperature, micro and macro movement (fingers, pulse rate), temperature and ambient lighting, removal from the wrist, and heart rate. It communicates by radio with a Base Station located in the residence. The base station processes the data acquired from the watch and identifies anomalous situations (e.g. suspected immobility, thermal disorder) and transmits the information to a headquarters for action. 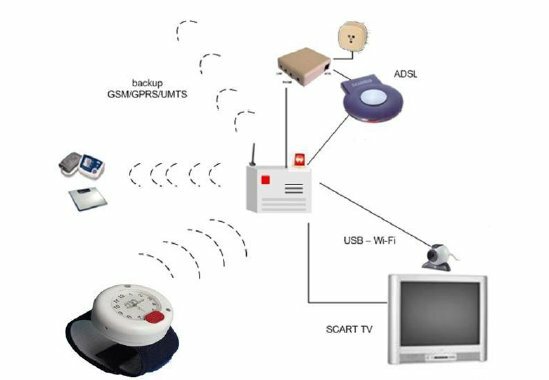 The tele-monitoring system also provides a video call feature to support the frail person and care worker in case of need. The watch is also equipped with a manual call button and a speakerphone system is incorporated into the product. The project is currently on going. Information on Housing management Combined service. In the current year, the ATC contact centre has the following customers: ATC Turin – (Social Housing company) ATC Biella – (Social Housing company) ATC Novara- (Social Housing company); ALER Lombardia –(Social Housing company); Exe.Gesi; VPS France. And provides cover to 180.000 dwelling units and more than 1.400 elevator units. The pilots at ATC will demonstrate how the use of information and communications technologies (ICT) can provide better quality social care throughout the existing or newly emerging services, at equal or lower cost, and increased quality of life. The aim of the action plan is to improve on the use of existing devices, identify practical steps to develop electronic systems for social records, support and monitor the elderly and frail and achieve faster rollout of targeted social services. With the Regional Decree finalized to apply LEAs on a regional basis, Regione Piemonte has tried to increase capacity to existing unmet needs, by undertaking remote monitoring of certain conditions having a high risk of isolation. Here health is affected by the psycho-physical as well as the psycho-social and is a matter for the individual as a member of the whole community. This is applies easily to frail elderly people. The inCASA Italian pilot will determine user needs by profiling behaviour. Tele-monitoring of vital signs will be omitted, as this is already being undertaken by the local ongoing project (but this data will be added to the composite user profile), the Pilot will focus on user behaviour, providing an useful profile to search and determine behaviour that could lead to health problems. This profiling will match the measuring approach advocated by LEAs for this kind of service, where integration activities linked to social and Healthcare Services could be undertaken by local authorities.